CASE Notes: My black additions to the card design help make it more suitable for giving to a guy on his wedding day and goes so well with the red and black theme of the card. Awesome project Fiona!! Love your card and colors!! Just perfect for a man! Thanks so much for letting me join your hop!! I'm honored!! Love this card Fiona! You have done a great case on Dena's card. Love the colours that you have used too. Terrific case Fiona! Love the colours - so suitable for a guy! I love the elegance of black and white with a pop of colour...the red is ideal. Pretty card, Fiona. I don't have this stamp set but now I'm thinking of getting it. Thank you for the inspiration. What a fun card Fiona. Love the colour combo. I am sure the newly weds are going to love it. Absolutely loved the color combo! Love love this!!! 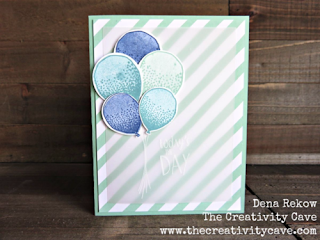 I've struggled to layer balloons so this is a great card to refer too. Lovely card and just right for a wedding!